Clint Eastwood attempts a light-hearted reproach to some of the more reactionary values of his previous films in this, his acting swansong. Recently bereaved Walt Kowalski (Eastwood) lives in a Michigan neighbourhood dominated by immigrants. Walt, a Polish American war vet and lifetime Ford automotive assembly line worker is an old-fashioned patriot with a foul mouth and casually racist views. His nonchalant relationship with the Hmong (ethnic group from the mountainous regions of southeast Asia) family who live next door changes when he catches shy young Thao (Bee Vang) trying to steal his beloved vintage 1972 Gran Torino car. It turns out the boy was doing it as part of an enforced initiation into a local Hmong gang, so Walt agrees to let Thao do jobs around his house by way of apology. A friendship grows between Walt, Thao and Thao’s feisty sister Sue Vang (Ahney Her) but the local Hmong gang soon comes knocking again for their pound of flesh. Eastwood was undoubtedly attracted to Nick Schenk’s first time screenplay for its resemblance to Don Siegel’s magnificent 1976 film The Shootist, a film that was to be John Wayne’s last. As in that film, an aging hard man must resolve a violent conflict without encouraging a young man’s emulation of his gun-toting ways. Eastwood closes the door on his quintessential white American male persona in a film that is also rich in allusion to Shane and the spaghetti westerns that made his name (as the man with no name). 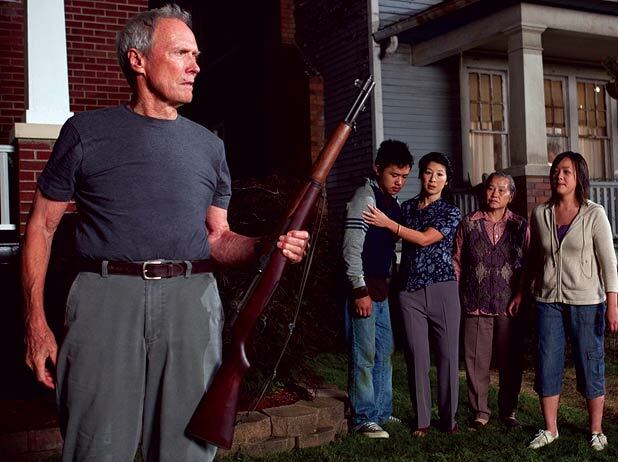 Deserving of that overused epithet ‘modern western’ Gran Torino brings together the two disparate thematic strands that have run through Eastwood’s work, namely that of the reactionary avenger (Dirty Harry, High Plains Drifter, Heartbreak Ridge) and the endearing portraits of goofballs and flawed idealists (Bronco Billy, Honkytonk Man, White Hunter Black Heart). Though uneven and often lacking the subtlety we have come to expect from this prolific filmmaker, it is a film rich in allusion, pride and warm comedy, one anchored by the unequivocal presence of one of cinema’s greats, brilliant in a role he was always destined to play. General release from Fri 20 Feb.